These shells are amazing in themselves. Do not have as high lift as Excalls but when mixed together what a show, crowd doesn't expect the difference in height! I have only used Excals for years. Now I will continue to mix Excals and the Hammers! New this year and they are worth it. Right there or bigger than Excalibur. Loud and proud. These were just as good as exchaliber and are worth getting these and exchaliber to run together!!!! 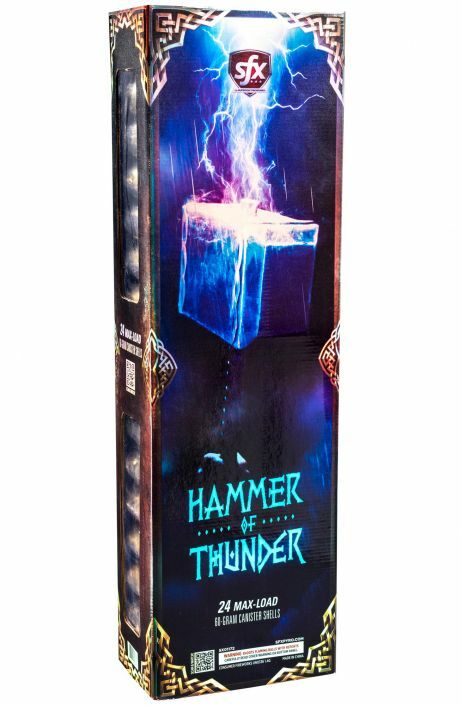 These HAMMER fireworks shells are TOO Legit to Quit. You can't go wrong these Hell to the knowl you better ask somebody I'll get'em like roscoe Jenkins. This product packs a punch. You can comfortably put the hammer of thunder up there with the other 60g canister shells. They are both load and report with amazing color effects. The quantity of shells you get in a package is and even count making it somewhat easy to sort shells and plan a show. Many of the tubes bases came off after a single shot. If these came with HDPE I would get these over the shells that rhyme with rextaliber.